New Zealand is a country of spectacular landscapes, and a prime example of this is Queenstown on South Island. Set against the shores of Lake Wakatipu, surrounded by alpine landscapes and isolated rural communities, it’s a place to get out an explore the natural surroundings. The best way to see Queenstown, Lake Wakatipu and the local area has to be on-board a lake cruise, where you have a full 360-degree view of the tranquil waters and the surrounding shores. What’s more, if you took a trip on a TSS Earnslaw day cruise, you’ll also be sailing on a piece of local history, adding to the already incredible experience you’ll enjoy soaking up the views. 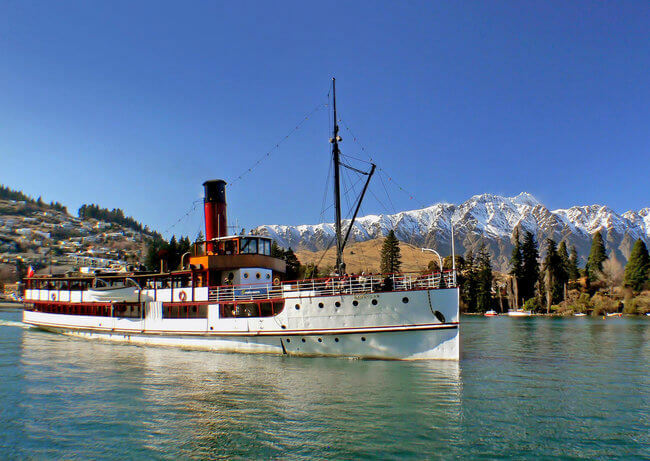 A cruise aboard the TSS Earnslaw is a truly unique experience, as not only will you be discovering Queenstown’s alpine scenery from the water, but you’ll also experience a little bit of its history: the 105-year old steamship itself. Commissioned by New Zealand Railways to connect the people of Lake Wakatipu, the ship embarked on its maiden voyage back in 1912. It was an essential link for the isolated lakeside communities, delivering mail and cargo in addition to passengers, and at 48 metres long, was the largest ship on the lake. The boat was almost scrapped in 1968, but was fortunately rescued by Real Journeys, who restored the ship to its original condition and who operate the TSS Earnslaw lake cruises. Today, it’s the oldest working coal-fired steamship in the Southern Hemisphere. It’s not only the views during your cruise that should be enjoyed, but also your time aboard the TSS Earnslaw. You’ll be able to explore much of the vessel and learn more about its century-long history, from the engine room, where you can see the working steam engines, to the mini-museum, packed with displays telling the story of this notable ship. There is also a cafe and licensed bar on board, so you can enjoy some refreshments during the cruise, as well as a piano singalong that is sure to keep everyone entertained. After boarding the cruise ship in Queenstown, you’ll embark on a journey across Lake Wakatipu to Walter Peak High Country Farm, where you’ll get a glimpse into rural life in New Zealand. 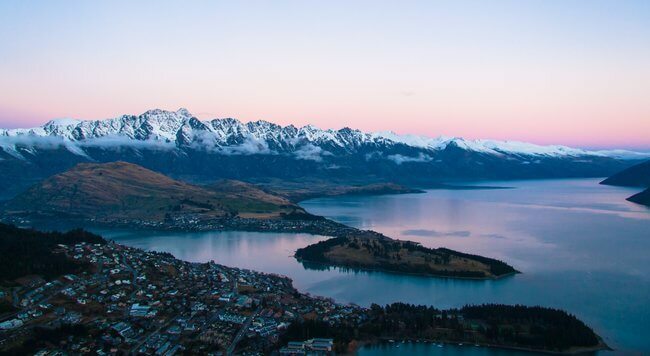 Along the way, you’ll enjoy panoramic views across the lake, taking in views of the surrounding mountains, including Cecil Peak, Walter Peak and the surrounding Remarkables mountain range. Guided farm tours, bike rides, barbecue meals and horse treks are all ways you can spend your time here at this charming lakeside farm before the return cruise to Queenstown. 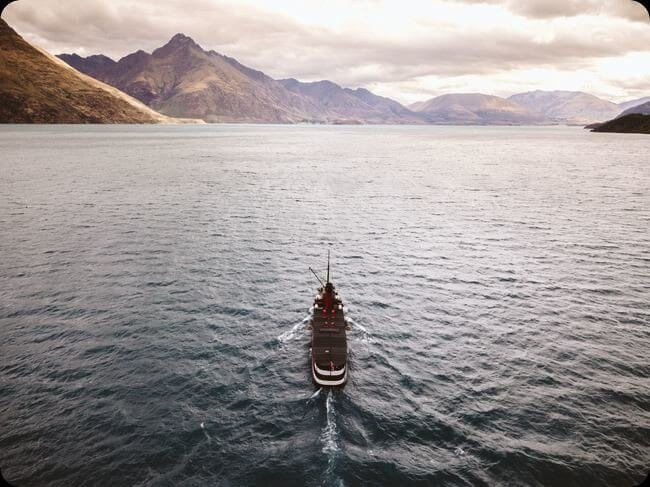 As part of The Very Best of New Zealand tour, we offer a cruise aboard the TSS Earnslaw as part of an optional excursion from Queenstown, which also includes a tour of the Walter Peak High Country Park. This walking tour is hosted by a local guide, taking you through the farmyard, first of all to the holding pens where you can meet the farm’s sheep, deer and Scottish Highland cattle. The tour then includes a stroll through the lakeside gardens before an optional gourmet barbecue lunch at the homestead. In the afternoon, you’ll have the chance to enjoy both a sheep shearing demonstration and the farm dogs rounding up the sheep from their hill paddocks, before heading back to the Earnslaw for the return cruise to Queenstown. Images by Holger Link and Josh Withers via Unsplash and Bernard Spragg via Flickr.